Key Features: Tilt/swivel, rear-curtain sync, high-speed sync, AF assist beam, manual control, wireless P-TTL, USB port for upgrades. Reasons to Buy: Very well-featured and cheap. Notable Drawbacks: May suffer from the same reliability issues as the DPT386AFZ. Slow recycle time. This is an upgrade of the DPT3 series, with wireless P-TTL and high-speed sync. 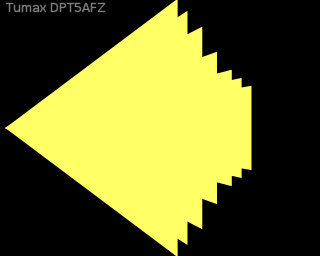 Tumax sells this as DPT586AFZ amd DPT588AFZ depending on the front appearance. As with the DPT3 series, it's likely that exact features may be improved in the future without a model number change. Unlike the DPT3 series, this flash zooms to 105mm, but note that this doesn't buy much in this case — note the "stubby" shape of the flash burst profile. Harvest One sells this flash as the Cactus AF50, and it's also the Vivitar DF-483, but Vivitar does not seem to currently offer the Pentax model.